In this guest blog, James Hughes, co-editor of Beyond Shelters, looks at the promising results of ending homelessness when homeless shelters adopt a Housing First approach. Homeless shelters have changed a lot over the last 25 years. I’m proud to have edited a new book called Beyond Shelters (James Lorimer & Co.) that makes this key point. One of the primary ways shelters have changed from Corner Brook to Vancouver is their adoption of a Housing First approach as the primary tool to reduce homelessness in the communities they serve. The book is a compilation of essays written by front-line veterans from the homeless shelter community in Canada. The authors write from the perspective of large cities and smaller communities as well as from the Maritimes, Central Canada, the Prairies, the North and BC. There was a time when shelters were simply a “hot and a cot” for the hundreds of mostly homeless men who had no other place to turn in their city. Considering the massive increase in the homeless population across Canada since the mid-1990s, shelters have grown not only in size but in the variety of services they offer, the kind of professional staff they hire and the type of relationships they build with social service partners in their milieu. They also have the benefit of new research that shows definitively that acting quickly to house newly homeless people or those at risk of homelessness can result in avoiding the very significant future healthcare, correctional service and judicial costs associated with homelessness. This Housing First approach is ably summarized by its founder, Dr. Sam Tsemberis, in Beyond Shelters, and has resulted in the near abolition of chronic homelessness in Finland. Canadian shelters are also generally big enough organizations to manage and operate large housing portfolios in which to place and support formerly homeless people. Indeed, many shelters are evolving into housing and home support organizations to ensure their exceptionally vulnerable clients get a real and solid chance at re-building their lives. In other words, Canadian shelters now have the research, skills, know-how, housing and home support expertise and relationships in their community to be one of the engine rooms of homelessness elimination in Canada. There are over 400 shelters in our country with approximately 16,000 beds under management making shelters one of the powerhouses of the sector. 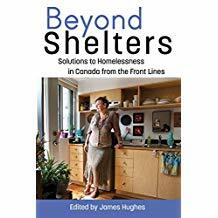 Beyond Shelters was officially launched at the National Conference on Ending Homelessness in Hamilton in November 2018 and can be purchased through the publisher’s website and in local bookstores across Canada.